Increasingly, cycling and technology are able to go hand-in-hand. Gone are the days when you needed a separate computer with wires to access the Internet. Now you can let your Smartphone’s Bluetooth and processor do the work for you while you enjoy your ride. Below we compiled some of our favorite apps that we think will enhance your experience while out on your bike. Strava is usually considered the go-to cycling app. It’s free, it works on both iPhone and Android, and its interface is relatively easy to use. Strava will track and store all of your rides for you as well as display your distance, speed and other metrics. In the “segments” section, you are able to see your past rides on leader boards and compare them to other cyclists who have cycled the same road. This “social network for athletes” lets you connect with friends, join clubs, and take part in events that are happening in your area. While this may seem like an obvious pick, Google Maps is a useful tool that is easily forgotten. 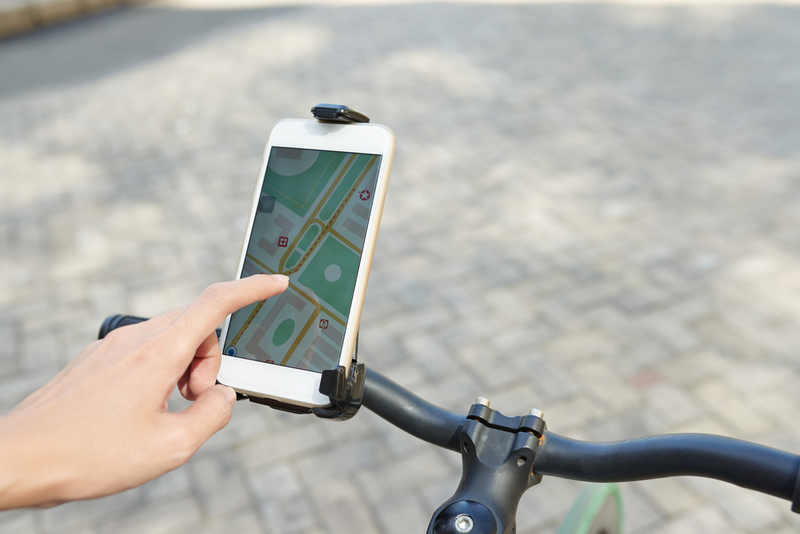 By using Google Maps you are able to create cycling routes on your computer that can be stored on your phone. You can also download and save portions of a map onto your phone in case you lose signal. Since Google has partnered with Waze, you are also able to get up-to-date traffic and road closure alerts. You can also use street view to check out that trail or tiny road you found on Strava. A word of advice: be careful using GPS heavy apps like Google Maps as they are draining on your battery. Unfortunately this app is only available for iPhone but if you are able to download it, this app will turn your iPhone into a cycling computer. Cyclemeter hosts a plethora of customizable options and plenty of post-ride analysis. While you will have to attach your phone to your handlebars to use the tracking features, you are able to stop/pause your rides using the remote button on your iPhone ear buds. Plus, this app stores the data directly onto your phone which means no logging in. MapMyRide has been around for a while, but it will provide you with all the basic route tracking features you will need while out for a ride. It is very simple to plot routes, save existing rides, and with a large database of routes available it makes it easy for those that want to explore. It’s free, but it does provide a premium version that comes with more features like a heart rate analysis, mobile coaching, and an add-free cycling experience. Developed in Britain, this is the first app that is devoted to providing first-aid information to cyclists. Unlike most of the other apps, this one is targeted specifically for cyclists and is based on some of the most common injuries experienced by cyclists while out on the road. While it doesn’t replace going to the doctor, this app does provide useful information about what to do if you are in a pinch. One downside for this app is the emergency contact information section is targeted for the UK; however, all of the first-aid advice is universal and easy to understand. While this app isn’t necessarily cycling specific, it is extremely useful if you want to evaluate your eating habits and keep a food journal. The standard version is free and provides an easy-to-use food tracking interface that will help you monitor your calories, macros, and exercise. You can set your own goals and set challenges for yourself. One downside to the app is the database is user-managed, meaning anyone can upload nutritional information into it. While this is sometimes a good thing, it does mean that you should double-check the food you search to make sure the nutrition information is entered correctly. For your inner hard-core cyclist, Bike Gear Calculator lets you completely customize the app to your specific bike. You are able to choose cadence, tire size, crank length as well as determine your gear ratio, gain ratio, speed, and pedal rotations. This app will help you determine if you have the right bike but the wrong gears and will provide you with on-the-spot information to help you improve your performance. You can also share all of your customizable bike information with others to help you solve bike issues. While this app comes with a lot of customizable cycling information, it can be too overwhelming for the casual cyclist. Bike Gear Calculator is free for iPhone and Android, although it does have a premium version. Love cycling on trails but have no idea where to go? Enter the MTB Project App. Designed to act like a local trail guide, this app connects you to some the best trails in your area and nationwide. It provides GPS information, elevation profiles, interactive trail features, and photos. This app also acts like a trail community, connecting you with other trail enthusiasts so you can find hidden gems and see where other people in your area are riding. Nothing is worse than your bike breaking and not knowing how to fix it. Instead of paying outrageous mechanic prices or buying a new bike, download Bike Doctor. Designed so that even a beginner can use it, Bike Doctor provides step-by-step instructions (with pictures) for 40 of the most common bike repair issues. Plus they are constantly updating the app to add new maintenance and repair tutorials. Bike Doctor is available for both iPhone and Android and it is completely free. While this also may not seem like the most obvious choice for cycling apps, Instagram can be used to share photos of your rides and create a vibrant, supportive community of like-minded cyclists. You can get creative with your photos and create a photo album of all of your adventures. Plus, you can scroll through other cyclist’s photos and get inspired and motivated from all of their photos. Just remember to watch where you are going and pull over to take that beautiful photo!